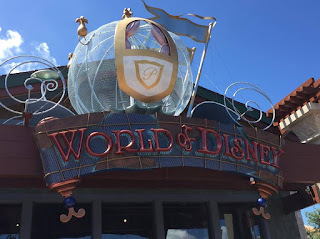 Travel Time : WDW Shopping Blog: Where to Find the Best Disney World Souvenirs! WDW Shopping Blog: Where to Find the Best Disney World Souvenirs! Walt Disney World has an enormous amount of places for shopping from high end stores to just regular souvenirs. Some found all in one place and some spread out among the parks. 1.The best place to find everything and anything Disney you are looking for is the newly named Disney Springs. You still have the anchor World of Disney store which carries everything you could imagine Disney. There are also new stores that have just opened including a few like Ugg, Tommy Bahama, Volcom, Na Hoku, Pandora, Sprinkles, Sephora, Alex and Ani and some new food choices added as well. There are still the already based stores like Co-op with TrenD and Cherry Tree Lane in there along with the pin trading store, Once upon a Toy, Disney’s Art Store is always a favorite to visit as well. Food like Rain Forest, T-Rex, the Boat House, House of Blues and others are still there along with the always needed Star Bucks which by the way does not sell Park Exclusive mugs. 2. Our next favorite place to shop is Walt Disney World it is more spread out but just seems much more fun to go through those shops. Most are on main street and each has specific items. Like Uptown Jewelers has their own Pandora store inside and sells other jewelry along with Dooney’s and Harvey’s and some other Disney Couture items. 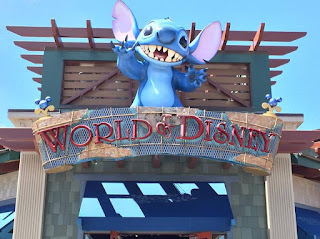 There are store connected to it includes their art gallery and the favorite bakery which is a must stop before you leave or when you enter the park. Across the street from that is the Emporium which carrier the Alex and Ani line of jewelry and all the princess items for the girls and items for the boys, toys, plushes, mugs, souvenirs and much more also clothing for men and women. 3. Mouse Gears is known to be the largest store out of all the Disney Parks it has everything all in one. It is located in EPCOT. Throughout the park though there are two port of entries to shop at and each country throughout has it’s own country specific items in their shops. One of our favorites happens to be Japan they have a large store and it’s hard to get out of there without getting some sort of Hello Kitty item. 5. Animal Kingdom is the last park regarding shopping they do have some shops which they have recently changed around but they also carry some Dooney and Bourke, Pandora, Alex & Ani and other souvenir items. There are also stores that carry items where a portion of the proceeds goes to their conservation fund. Different items for different part of the parks depending on the part you are in like Asia, etc. 6. We also like shopping at the resorts one of our favorites is Grand Floridian. It’s not a large shop but there is a children's and souvenir shop and some specialty shops for women, men and spa items as well. Then its the Polynesian with the more Island style items which is fun and different and the Contemporary which is easy to access all of these 3 from the Monorail and fun to just visit and wander around the stores and the resorts.